Relay For Life participants Friday evening in the parking lot at Gilead Friends Church. More photos at www.morrowcountysentinel.com. 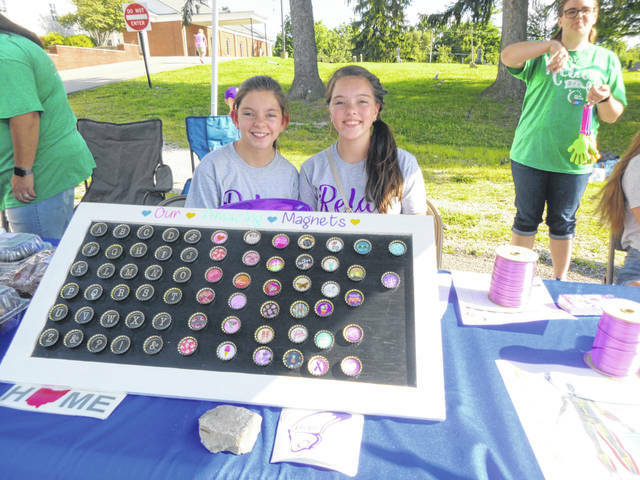 Magnets made by Layla and Lucy Murray, daughters of Jan Boyd, a Morrow County Hospital Relay For Life team captain. Lighting of the luminaria, a Relay For Life tradition. MOUNT GILEAD — Jan Boyd lost her mom to lung cancer in 2005. Boyd and her daughters, Layla and Lucy Murray, came out to honor Janet Conner at Gilead Friends Church on a beautiful Friday night as part of the annual Morrow County Relay For Life event. About 25 Morrow County Hospital associates and family members joined Boyd and her daughters in the walk. “We are the Walking Warriors of Morrow County Hospital,” Boyd said. MCH team member Bridgette Rhoads also recalled losing her mother, Stacy Lyn Siegfried Whitt, three years ago to cervical cancer. She had a luminary bag with her name on it in her memory. Relay For Life is a community-based fundraising event of the American Cancer Society. Each year, more than 3,500 Relay For Life events take place in more than 20 countries. Heather Robinson of 31 Gifts came to sell items and help a co-worker. “A lady in our home office, Kate Rose, was diagnosed with breast cancer. She is loved by all of us,” Robinson said. T-shirts, balloons, spirit sticks and other purple-colored items were displayed by everyone from toddlers to those in their 80s. Robinson had pink shirts with “Believe. #KHR” for Rose printed on them. This marked the 19th year for the event in Morrow County and the fourth year at the church. A silent auction was held and a ham dinner served to survivors. Greg Mooney told his story of beating cancer. “I was blindsided. But adversity both toughens us and softens us,” Mooney said. 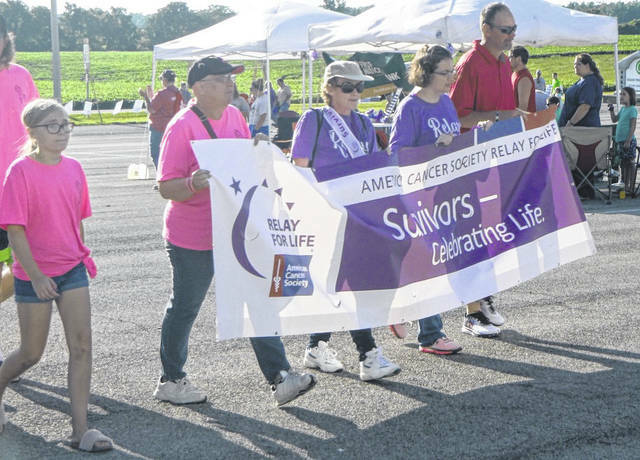 As the American Cancer Society’s most successful fundraiser and the organization’s signature event, the mission of Relay For Life is to raise funds to improve cancer survival, decrease the incidence of cancer and improve the quality of life for cancer patients and their caretakers. “Survivors, you inspire us to keep up the fight against cancer. You are the reason we relay,” Mattingly said.